I’ve got an Iron Man figure from Hot Toys on my shelf. It’s 1:6 scale, and is worth a couple hundred bucks. This one is 1:1 scale, and costs almost $8000. 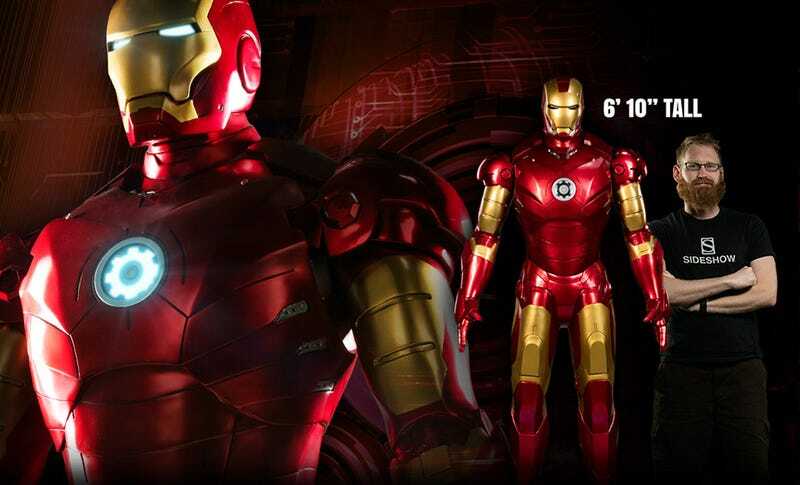 Called the Iron Man Mark III Life-Size Figure and built by Sideshow, it’s not really a figure, in that you can’t pose it. It’s not a suit either, because you can’t put it on. So let’s maybe call it a statue, one with “expertly reproduced layered armored panels, subtle weathering, and many fine details”. Standing 6'10" its eyes, palms and arc reactor all light up, meaning if you’ve ever wanted to roleplay Tony Stark to the point where you’ve got full-size Iron Man armour lying around the back of your workshop, here’s your shot. The actual price is not $8000. It’s $7950. You’d hope shipping will be included in that.